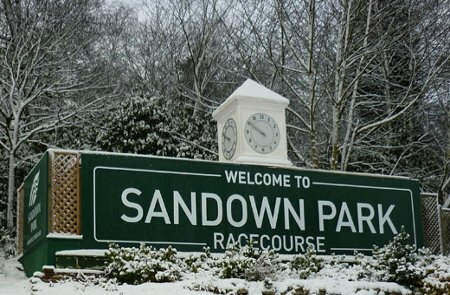 Sandown is one of the busiest and best racecourses in the country. By the end of 2004, it had already staged 26 fixtures and nearly all were of a very good standard. Sandown is one of the best viewing tracks in the country, with the whole course in sight from the Grandstand. Although, it can be tricky working out just what is happening on the sprint course. Sandown's main national hunt fixture is the Tingle Creek Chase over two miles in December and it is the most important race of its kind outside the Cheltenham Festival. The Esher course also holds the Betfair Gold Cup as part of an excellent finale to the season in April. Flat - A right-handed oval course with has a stiff uphill finish. There is a separate straight track for the sprints in the middle of the course. Jump - A right-handed track - and very testing too. The Railway Fences are a major test of a chaser's fencing with the stiff climb to the finish changing the result of many a race. The racecourse lies approximately 15 miles from central London on the A307, which can be accessed via the M25 (junction 10) and the A3. Free parking is available. To Esher, close to the racecourse. If you’re interested in placing some bets on the races at Sandown Racecourse but you don’t want to leave the comfort of your own home, you’re in luck because you can do just that at the online sportsbooks featured below! These online sportsbooks are some of the oldest and most trusted sportsbooks in the betting industry, so we’re confident that you’ll be impressed with everything that they have to offer! One of our absolute favorite online sportsbooks is Paddy Power. We’re huge fans of theirs because they are currently offering one of the most generous welcome bonuses that we’ve come across recently. At the moment, they are giving away $50 in free bets to all of their new customers just for signing up! This is a great opportunity to give your balance an instant boost, so head over to Paddy Power today to get in on the action while this offer lasts! Click here to bet on Sandown races at Paddy Power! Bet365 is another one of our favorite online sportsbooks because they are also offering all of their new customers a free bonus that you won’t want to pass up! For a limited time, when you signup and make an initial deposit, you’ll instantly be eligible to receive up to $200 in free bets at Bet365! There’s no telling how long this promotion will run for, so be sure to visit their website today to claim your free bonus money before it’s too late! Click here to bet on Sandown races at Bet365! At Ladbrokes, an established and respected online sportsbook, all new customers are currently eligible to receive up to $50 in free bets! All you have to do is make an initial deposit and you’ll instantly be eligible to receive this free bonus money! This is a limited time special that expires soon, so be sure to head over to Ladbrokes today to get your free bonus money before this offer expires! Click here to bet on Sandown races at Ladbrokes! If you’ve never placed a bet before at Bodog, you’ve been missing out on one of the most popular and trustworthy online sportsbooks around! They have been in business for many years now and we are proudly recommending them to all of our website visitors! At the moment, they are giving away a free welcome bonus to all of their new customers, so head over to Bodog today to learn more about this great offer! Click here to bet on Sandown races at Bodog!